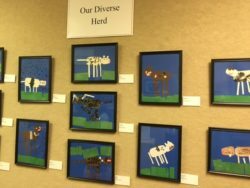 An exhibition featuring artwork from local preschoolers fills the hallway walls outside the classroom at the Albrecht-Kemper Museum of Art. Instructor Caroline Clark Murphy has done an amazing job with the Museum’s outreach programs, and we are proud to present the 7th Annual United Cerebral Palsy (UCP) Art Exhibition. The works included were created by young students, ages 4-6, with and without disabilities who attend UCP’s integrated preschool. Included in the exhibition is a collection of art from each student. Due to interest, illness or other situations, some children have more pieces than others. All however, are a beautiful example of the creative spirit of young children. The Albrecht-Kemper is excited to have the venue to showcase the student’s talent. Our hope is that you will not only appreciate the children’s work in this exhibition, but are also inspired to rekindle your own inner child and got out there and start making your own art. An Opening Reception will be held Thursday, April 27th from 4-7 pm. There is no charge to attend the Opening.